A favorite activity among Emirati locals is exploring the desert by 4x4 vehicle. 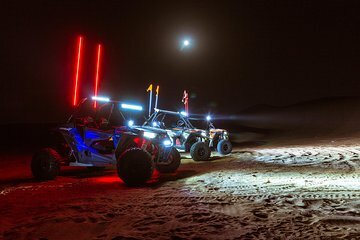 Venture across the moonlit desert in a powerful 4x4 buggy and cover 34 miles (55 kilometers) of rugged terrain. Follow your guide through the vast expanse as you race through the desert for an hour or two. Stop for a quick campfire snack in the middle of the desert and enjoy complimentary round-trip hotel transfers within Dubai.